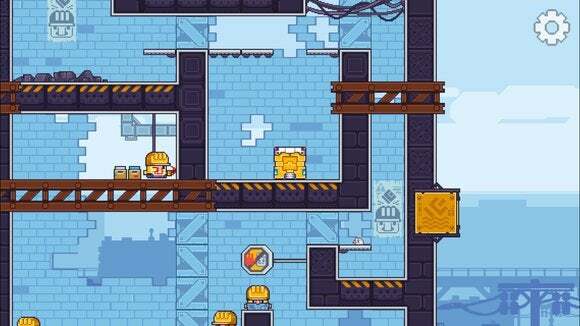 Gunbrick is a hybrid platformer/puzzler that tasks you with “shooting and rolling your way to victory,” to paraphrase developer Nitrome’s description. This challenging title features stylized pixelated art, unlockable adventures, boss fights, and of course, a gunbrick—which is exactly what it sounds like it is. To jump right in, here are the three reasons why Gunbrick stands out as a clear winner. Strange world, stranger concept: The world of Gunbrick is one in which square bricks have seemingly replaced cars and all other modes of wheeled transit. Angry nerds, mechanized baddies, aggressive police, and some form of mutants all stand in the way of our hero, who purchases a gunbrick after seeing one advertised on television. That’s about all you’ll get in terms of backstory or plot. The art is sufficiently strange—but adorable—to keep players immersed in the world. Our hero goes on a bit of a rampage with his new gunbrick. One side of the brick is a shield; on the other, a gun. You can use the gun to move around (a la the underrated flash title “No Time to Explain”) or just roll around like a quadrilateral. These two techniques—shooting and rolling—provide the backbone of the puzzles. 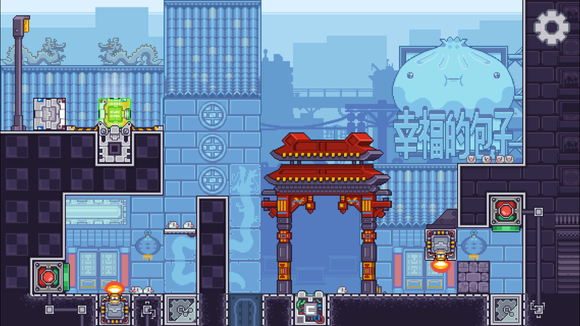 A big ‘ol puzzler: While you’re essentially moving around the strange world of Gunbrick—which features a Japanese-style downtown, then a Western Las Vegas-like spoof with sewers, boss fights, et al—you’re actually navigating through complex puzzles. Even moving up to the next level of a building is a trial, because you can only go up by shooting the ground. This requires you to line your gunbrick up in the right space to make the jump. Understanding how to calibrate your gunbrick in the world around you is essential to progression, and the initial levels do a great job of holding your hand before the puzzles get more elaborate. You go from navigating the world and destroying enemies (through bludgeoning or shooting them, and it’s exceptionally entertaining to watch the mayhem) to attempting to solve complex tile and movement puzzles. That police vehicle isn’t pleased with you, and there’s only one way to settle it: Boss fight! By the time your first boss fight arrives, you’re prepared to handle whatever is coming at you. After an hour of playing, your rolling brick goes from an awkward annoyance to an intuitive character. Classic feel, simple controls, and no in-app purchases: While the gameplay is difficult and frustrating at times, the controls are actually very simple. You drag your finger in either direction and tap to shoot. That’s it. Again, since you’re rolling a brick square, there’s a lot of precision involved in how you line up your shield and gun. The developers have done a good job of making sure that there aren’t any accidental deaths from not making a jump or slipping with your finger. Essentially, if you die, it’s because you didn’t line up your brick correctly. That may not give many players solace after dying a dozen times in the same flame-and-switch trap. 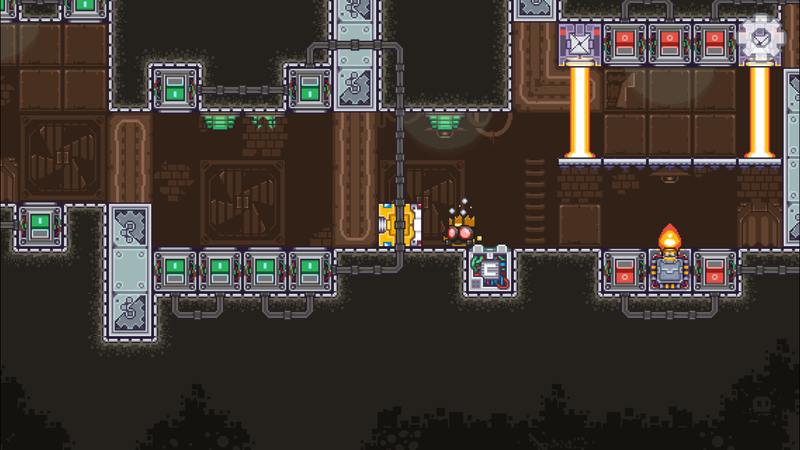 The puzzles become more advanced, even if the enemies are still no match for your Gunbrick. Nitrome also boasts that Gunbrick doesn’t have any in-app purchases, and is safe for kids. While I feel like a lot of the subtle satire and difficulty may be better suited for adults, in my experience playing it, yeah, it’s not a bad game for your precocious youngster either. Just be prepared to answer questions about the game’s nonsensical plot and why the big-nosed duck-like pilot is fighting the police. I have the same ones myself. While iOS is experiencing a revival of retro-inspired puzzle and platform games, Gunbrick is just original and weird enough to marry the two ideas well and yes, earn a spot on your iOS device.